1. So far, so good! There’s been a nice turnout at each stop, and people seem to be enjoying the set-up of rolling a die to find out what I’ll be doing that evening. I do a few variations of this; for example, last night in Chicago, because I was at the American Writers Museum, I talked writing process (and then rolled for the other things), while in Fort Collins, because the event was at a church, I actually did a sermon, complete with Bible reading, because, come on, how could you not? But the goal of making it different and fun each night is working, it seems. 2. The book also appears to be doing well — reviews are positive and the sales are very good. We’ll see if it shows up on bestseller lists, although so much of that depends on factors entirely out of my or anyone else’s control, and doesn’t necessarily track with total sales. The Collapsing Empire sold the most units in the first week of any book I’ve put out (so far) and it didn’t hit the NYT hardcover list, sooooo who can say? It does look like Fire is doing at least as well as Empire, however. Can’t complain about that. 3. 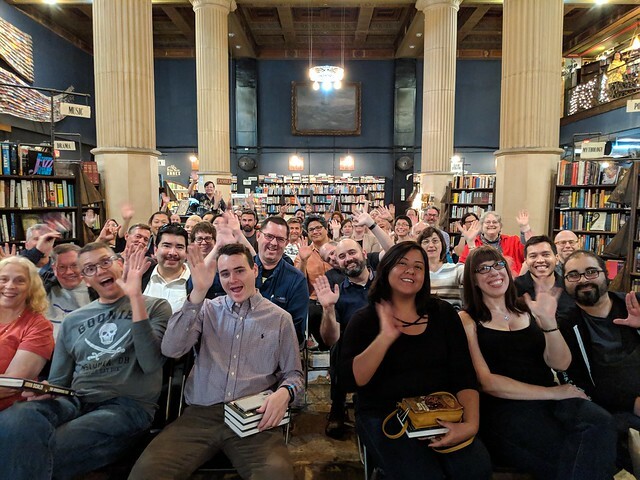 I wish I hadn’t’ve booked so many early morning flights (today I was up at 5; when I went to LA, I had a 2:40am car pickup, which was kind of hellish), but seeing fans and friends has been worth getting up early for (although I usually call it a night early). And I’m pretty sure today is the last early flight! It’s sleeping in from here on out. 4. I’m doing more walking this tour — a couple of stops where the event was a mile or so from my hotel, I elected to walk over rather than take a car. Between that and the usual airport walking (especially at big airports), I’m actually getting exercise. I kind of need it, I have to say. 5. After Sunday, I get to go home for one whole day, and then I’m off to France. Wheee! In all, everything is groovy so far. Chapel Hill, Raleigh, Athens, Charleston and Austin, I’ll be seeing you soon. View From a Hotel Window, 10/22/18: Chicago! View From a Hotel Window, 10/23/18: Chapel Hill! Looking forward to seeing you in Chapel Hill tonight! Dress warm. Is there a time yet for the Austin event? I looked at the Tor site for the tour last night and it still stated the time was “TBD.” My 17YO and I are looking to drive over to Austin (from Houston) for the event, depending on whether the timing will work out. Oh, I think I found it at the Texas Book Festival site. 11AM in the Central Market Cooking Tent. Will there be cooking? Perhaps a BURRITO? I hope to see you there, pending the 17YO’s schedule. I’m so glad it’s going well for you so far, and I hope you have a wonderful time in beautiful France! Sorry I missed you last night in Chicago. We had tickets, but some (minor) health issues got in the way. Glad the tour is going well. 11am. Check with the actual festival site; they have all the details. I have a copy of The Consuming Fire. Doing my part 😀. One question. On your list of novels in the book it lists ” Unlocked” in your “Locked In” series. An upcoming book? A tease to your readers? Safe travels. You’re probably better off at early hours than most authors – given that the aftereffects of alcohol consumption isn’t a problem for you. Looking forward to seeing you this Saturday in Charleston! I’m not going to be able to make it to any of your stops on this tour, but I can say that I am happy to have contributed to your first-week totals by pre-ordering the book last summer. My (signed) copy arrived conveniently a few days before our vacation started, and I enjoyed it immensely. Lady Kiva is still my favorite ever, but she has good company in this book as well. Thank you for augmenting the fun of this vacation so very capably – enjoy your day at home this Sunday, and safe travels always! Do your body guards mind the walking? I assume it makes their job of securing the route much harder when you are not in your bullet resistant car. Are you coming to Paris as part of the tour ? Indeed – when/where are you coming to Paris?